ウエスタンキッズ © 1991 Visco Corporation. Western Kids is a side-scrolling action/adventure game published by Visco. The last vestige of respect for law and order in the Old West is about to face its worst hour. The evil Scorpion gang has been causing much mischief in town, and rumor has that they plot to attack the next incoming train. But the Sheriff is apparently not going to let that happen and he has decided to arrest the notorious outlaws... unfortunately, he has never been seen since. His young son Sam, the newly appointed sheriff, decides to look for him and, helped by his sidekick Popo (aka Little Chief), he goes on a perilous journey to stop the criminals once and for all. Western Kids is an unusual adventure/action game where the player explores parts of the large town (or its outskirts), collects gold from chests and crates scattered around, visits stores and other buildings (such as saloons, hotels or houses). All kind of foes wander also around the narrow streets or sceneries (from swordsmen, gunmen to farmers, army men and even dogs and pigs! ), and they all of course inflict damage upon contact. This exploration phase is at the core of the gameplay and Sam usually has to purchase a map, find keys (to unlock certain buildings), talk to villagers, explore basements and caves, play mini-games, retrieve special items or trigger events that may open new passageways. 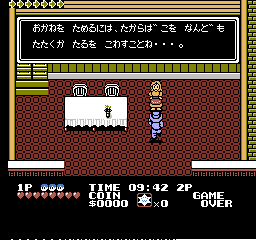 Additionally, the player starts equipped with a knife, but a gun and a rifle can be collected later in the game (a boomerang and a tomahawk for Popo). The player also comes with a limited amount of life symbolized by little hearts, and more can be obtained by collecting Sheriff stars (five stars grant an extra heart, but collecting a skull instantly removes one!). Finally, countless items can be purchased inside stores, such as food (extra health), hat (extra life), meat (refills health upon death), ladder (used to escape underground places) or bullet proof vest (temporary invincibility). Once Sam completes a level (each stage has its own challenges and requirements), he can finally makes his way to the boss and face one member of the dreaded Scorpion gang. Western Kids consists of seven vast levels (the first six can be played in any order), as well as a two-player simultaneous mode. Western Kids was released on September 13, 1991 in Japan. It was sold 7800 Yen. [US] "Cowboy Kid [Model NES-9C-USA]"